We all know that skating is a blast, but did you know there are different kinds of skates for just about every use you can think of? From beginner skates to pro-level inline speed skates, finding the right gear is critical to getting the most out of your time at the rink. 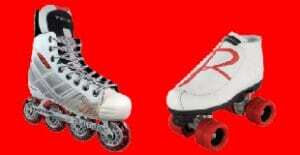 Skates without wheels are basically just shoes. Sometimes, though, we tend to over overlook these most crucial components. Getting the right wheels for your skates is a really big deal! Check out some of the styles our pro shop carries below and then talk to one of our associates to find out which wheels are right for you or your children. Our pro shop can be visited any time we are open, including our extra summer hours on Thursdays from Noon to 3 p.m. Our staff has tons of experience and can help you find a set of skates to match your skill level and favorite skating style. For more information, give us a call or stop by during business hours!